Create with Traci: July Stamp of the Month Blog Hop- Happy Forever! Welcome to the July Blog Hop featuring the new Stamp of the Month for July1-31; Happy Forever. If you've arrived from Jody's blog... you're going in the right direction... the next link is at the bottom of this post. Oh My Gosh... I love this stamp set!! I am as excited as you are to see all the awesome ideas this month!! I literally used this set with 3 different paper packs so far because there are endless ideas roaming through my head!! Today I'll show 2 of my cards and I'll save the 3rd for another post this month! Spend $100 get the SOTM FREE!!! This first one uses the Topstitch paper pack. 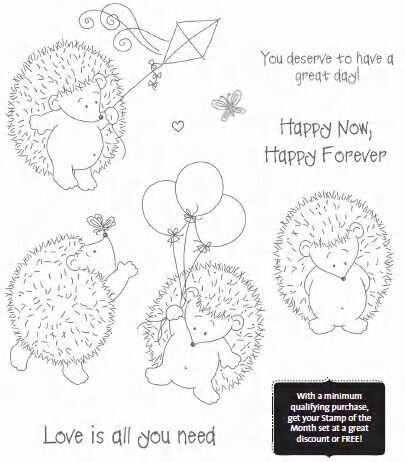 I used both the Happy Forever, and the Togetherness Stamp Sets. Blush and Chocolate ink pads, Chocolate and Heavenly Blut markers, white daisy just blooms and some buttons in Blush and Crystal Blue. The Second card uses one of our Clear Card Bases (scalloped) along with the Splendor Paper pack. This time my hedgehog is colored with Bamboo and Desert Sand markers. My cloud paper is edged with Desert Sand. I also used a Tulip button and Tulip marker on the kite because I think Tulip is awesome with the Splendor paper pack colors. The button is paired with retired Seafoam organdy ribbon and the Colonial White Waxy Flax. On the inside of my card- you can see the little kite poking out- but it doesn't bother me- The Goldrush circle has my sentiment so you can sign the card on the cloud paper under where the Goldrush circle will hide it. Everything is adhered with Tombow Vellum Adhesive- it does show slightly but not as much as regular adhesive shows. Hope you enjoyed my little peaks at this fun new LIMITED stamp set- get yours here while you can. Now- check out Andrea's artwork!! I love the clear cards! Very cleaver! Wow I love both of these! I used the clear cards too - I just love them. Thank you for the inspiration! I love the soft colors you used in the first card! Great job! Adorable cards, love the patterns and colors that you've used, thanks for sharing! oops, I was at the wrong site. Thanks. Sweet cards - love the clear card! Wow I the first one is super duper cute. The stitching is a great touch.